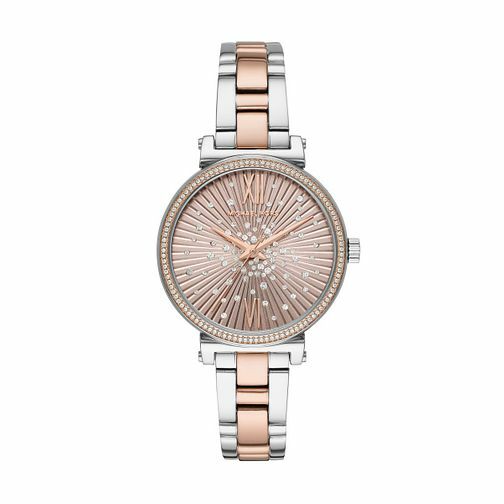 Sophisticated and sparkling, this Sofie ladies' bracelet watch by Michael Kors is set with sparkling diamante stones, in a whimsical effect upon the rose dial and encasing the bezel. A sparkling scatter compliments the rose gold tone hands and subtle 12 and 6-o-clock roman numerical hour markings. The rose gold plated stainless steel case co-ordinates in style with the two-tone stainless steel bracelet. An understated touch of glamour, the perfect finishing touch to day or evening looks.